Suzan Entwistle believes the public should call for the resignation of Spokane County's medical examiners. To Heather Ostby, it doesn't matter that the commission that oversees the practice of medicine in Washington state did not find anything wrong with the way her mother's autopsy was conducted. The commission's decision this month to close a yearlong investigation into 14 autopsies means that both Spokane County medical examiners are, in the state's eyes, in the clear. In short: They didn't deviate from the standards of care in their work. But that doesn't change the facts in her mom's case: Cindy Lou Zeppenfeld Bergan was trying to escape domestic violence and had filed for a protection order before she went missing in January 2016. Her body was found that month on the side of the road near Cataldo, Idaho, wrapped in plastic and duct tape. Yet the 46-year-old's death certificate says she died of natural causes. Dr. John Howard, one of Spokane's medical examiners, conducted an autopsy and found that Bergan likely died of a heart attack. Relying on the forensic pathologist's expertise, the Kootenai County deputy coroner signed off that the death was natural. Making that call is absurd to Ostby, as she believes it required overlooking other injuries and ignoring the circumstances around her mom's disappearance and death. The state did not find anything wrong with the work of medical examiners John Howard and Sally Aiken. So last spring she joined more than a dozen other families with similar concerns in filing complaints against Howard and fellow medical examiner Dr. Sally Aiken. Each family questioned the official rulings on their loved one's cause or manner of death, which can be listed as suicide, homicide, accident, natural causes or undetermined. In some cases the rulings affected whether and how police and prosecutors pursued investigations. But the governor-appointed Medical Quality Assurance Commission doesn't have the power to change a death ruling, says Micah Matthews, deputy executive director of the commission. "There were some limitations on what we could do," Matthews says. "Our ability to question these decisions and reverse them is extremely limited. We don't have the ability to do that." In a typical case review, a panel of the commission's doctors and members of the public might be asked to look at whether a patient was harmed. But even if, for example, they found someone was misdiagnosed, they wouldn't issue a different diagnosis, Matthews says. "Not to be blunt about it, but in this case there isn't a possibility for patient harm because they are deceased," Matthews says. "It was tricky for us to narrow down what is our legal ability here, who can reverse those [decisions]." The commission instead focused on whether a doctor with similar training would reasonably have followed the same procedures in the autopsies, and ordered an unnamed expert in forensic pathology to review the cases. Based on that report, the panel closed the case March 1. But that won't stop the families from demanding their cases get a deeper look. "Let's call it a closed chapter," Ostby says of the investigation. "Really it's about finding the next place to go. The next best option is to fight for justice for my mom's case." "I don't think their decision, by any means, means that these are great medical examiners, and these are great conclusions," says Dr. Suzan Entwistle, who has doggedly pursued review of several of the cases, including that of her husband, Dr. John Marshall. Marshall, chief of surgery at the Mann-Grandstaff Veterans Affairs Medical Center, went missing during an early morning jog on Jan. 25, 2016. His body was found floating in the Spokane River the next day, and Howard ruled that he had accidentally drowned. Entwistle, also a surgeon, disagrees. After reviewing the autopsy and photos, she believes her husband was severely beaten and dumped in the river. She notes that he was found on the north shore near the Monroe Street Bridge, which is not typically where bodies or objects dumped into the river near downtown wash up. For Julie Beauchaine, learning that the commission had closed its investigation put her at a loss for words. In 2012, her cousin Kala Williams' body was found cut in half and stuffed in sleeping bags in the woods. Howard performed the autopsy on her remains and ruled the cause and manner of her death as "undetermined," as the circumstances surrounding her death weren't clear. Meth was found in her system, and according to the Spokesman-Review, Howard explained that he couldn't rule out that she'd died of an overdose and someone had disposed of her body. But the Spokane Police Department hired a second forensic pathologist, Dr. Carl Wigren, to review the autopsy, and in a 2013 report he determined she was likely sexually assaulted and killed, and her death should have been ruled a homicide until proven otherwise. Wigren's report pointed in part to stab wounds that could indicate she defended herself and the fact her undergarments had been cut open. DNA on tape and clothing in the bags came back to Robert G. Davis, according to police, but Davis, currently in prison for sexually assaulting a Coeur d'Alene woman in 2014, hasn't been charged in relation to Williams' "undetermined" death. "It's a complete slap in the face for all these families and potential victims that are going to be out there," Beauchaine says of the commission's lack of findings against the medical examiner. "They're just not looking at the facts. They just don't want to go through all these other cases to rectify the few." Multiple people involved in the complaints wonder why Howard and Aiken seem unwilling to change their determinations. All the families have talked to the medical examiners about their cases, but Entwistle says they've pretty much dug in their heels and stuck with their initial findings. "These cases are blatantly homicides," Ostby says. "It is beyond comprehension why they're not able to look at these autopsies as medical examiners and see the truth any more. I think they've become blind to it." Neither Howard nor Aiken responded to multiple emails requesting comment. Now that the state's investigation is closed, the families are weighing their options, which in most cases appear to be limited. They can appeal the commission's decision within 30 days, but would need to include new evidence of some kind to reopen the investigation. Another option, according to commission staff, would be to file a civil suit demanding a judicial review of the case. But Entwistle's counsel told her that that process is mostly in place for families who want to overturn a suicide ruling, as that can prevent life insurance from being paid out. Entwistle requested an outside peer review of her husband's autopsy from the Spokane County Commissioners, but they pointed her to the same judicial review law cited by the medical commission. "Right now there is no process to appeal a medical examiner's decision," Entwistle says. "The only thing they say is you could take them to court, but you have to pay for it and the burden of proof is on you. How many violent-crime-victim families can do that?" 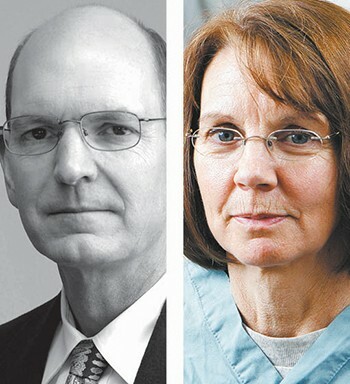 Entwistle and Ostby think the medical examiners should step down, or the Spokane County Commissioners should fire them, and they hope other elected officials at the local and state level will stand up and ask that their cases get reviewed. "I think it's time that they resign," Ostby says. "There's cases here where they've had government agencies and independent examiners say, 'You're wrong. Change this,' and they're refusing." In light of the fact that some determinations can stop police investigations in their tracks, Gayle Libutti wonders whether it's the protocol for making judgment calls about how someone died that should be changed. Her daughter, Sarah Schmidt, was found in the Spokane River in May 2016, and Aiken ruled her death a suicide before the results of a toxicology report came back. Schmidt had handprint-shaped bruises and other injuries, but once police shared evidence with Aiken and she made her ruling, the investigation was concluded, leaving the family wanting more answers. "Based on all that I have been told by professionals, it appears to me that it is the protocol that requires attention and change," Libutti writes by email. Like the other families, Libutti just wants her daughter to be remembered for the great person she was. The original print version of this article was headlined "'Slap in the Face'"